This USA-made cooler bag is just the right size! 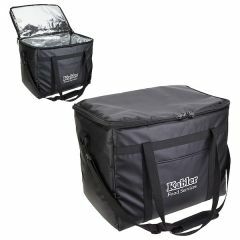 Made from premium 900 denier polyester, it features polyweb handles with a gatherer and can fit a 24 can drink pack! The price includes full color, full bleed dye sublimated printing on both sides of the bag. Please note that the insulated liner is made in China.